Brief Synopsis – A millionaire decides to distribute his wealth before he dies by choosing random strangers to grant a million dollars each. My Take on it – This is a film that hooked me as soon as I saw what the premise was all about. The idea to give us eight seperate stories in this film wors really well and each of the varous segements work on their own. Loved how all of the stories felt very unique and that they didn’t feel the necessity to rehash certain aspects of it all for every one of the “winners” of this lottery. We get to see how each of their lives are changed for both the better and for the worse because as we can see from these stories it isn’t always a blessing to receive such a large sum of money with no strings attached. The fact that each of the stories have various lengths is great because since there was no requirement to fit each tale into a certain runtime, we can feel that they give the optimal time for each one whether it be for 3 minutes or even 20 minutes as long as the story gets told well. 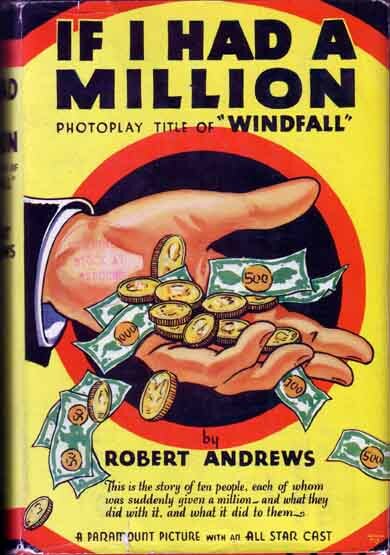 This film was remade as a TV show in the 1950’s that lasted 6 years with 207 different stories of how people would react to receiving such a windfall. There was also a TV movie starring Martin Balsam that came out in the 1970’s with a similar premise. Loved the way that not all of the stories have happy endings because that allows us to see various reactions in life to such a surprise. They also do a great job of mixing together some serious dramatic stories with comedic ones. The cast is superb and the fact that even actors that have very short screen time were willing to take part in such a film says so much about what kind of brilliant idea this was. My favorite stories were “The Forger” and “the Accountant”. Would love to see this idea remade and re-imagined for the 21st Century because I think it would work so well. Bottom Line – Excellent movie with such a great premise. Loved the way each of the stories is unique and we get to see how each person’s life is changed for the better or for the worse due to this new windfall. Really enjoyed the fact that they didn’t feel as if they required each segment to be similar length and some are extremely short while others take a bit longer to get to the point. A premise like this would work really well today as a remake or even as a TV series (which was already done in the 1950’s, yet still would work now.) Excellent cast which shows that even talented actors and actresses were wiling to take part in this even for very short screen time each. Highly Recommended!